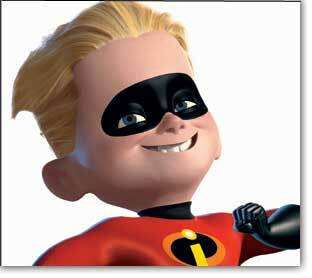 Brad Bird’s Super-Insights on The Incredibles! I love the interviews we present here. Especially because they occur between two filmmakers, which, I think, evokes a different atmosphere for the kind of discussion that can take place. 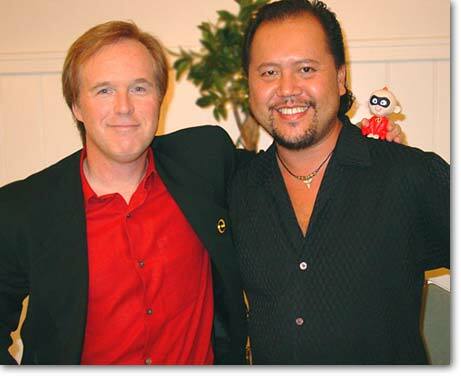 Such is the case in our interview with Brad Bird by Sam Chen, whose computer animated short film, Eternal Gaze, took top honors at SIGGRAPH 2003 and is currently developing a feature-length CGI project. Sam and I had the privilege of attending an early screening of The Incredibles and then sitting afterwards with the film’s writer and director. When it was announced about four years ago that Bird's next film would be made at Pixar, I recall how everybody I knew in the animation industry was inspired about such prospects. So, to see this collaboration come to fruition is exciting and, with this interview, we at AnimationTrip are proud to participate in celebrating their achievement and success. Sam Chen: First of all, congratulations. You guys are batting a thousand. Six for six at Pixar. I see the Chuck Jones influence and all my friends who worked on this film at Pixar say that this is their favorite Pixar film. And I finally had a chance to see it. SC: First of all, also congrats on The Iron Giant Special Edition DVD that’s coming out. SC: So are you finally at peace with the way they’re doing it? BB: Well, you know, the important thing is that I was able to make the movie I wanted to make, and people are catching up to it. We’ve had tremendous luck with people seeing it and tending to recommend it rather religiously to their friends. So that’s really nice. There are always more and more people who are seeing it and catching up with it. So it’s great. I think a lot of my favorite films were not hits initially too. You know, The Wizard of Oz, A Wonderful Life, and Pinocchio, which I think is probably the greatest animated film ever made. All of those films had to find their audience and I think that’s what’s happening [with The Iron Giant]. BB: Yeah? And you talk to people now, and they’re convinced that it was a big hit, because it seems like it was because it was so influential. SC: Yeah, it’s my favorite film of all time. So, you started at Turner, Disney, Fox, WB, Pixar… I want to talk to you about Milt Kahl. What was the biggest lesson you learned from him? BB: Probably to not be satisfied and not quit. I was like any kind of kid fan in that I’d say, “Geez Mr. Kahl! You’re just the most awesome thing ever! You’re the most amazing draftsman!” And he’d say, “M…M…Mark Davis is a better draftsman, but I’m a better animator!” But he gave me the impression that it wasn’t just talent that made good animators great. It was that they didn’t quit. He believed that if his animation was better than anyone else’s, it was because he worked harder. I got to watch him do a little work and he would…you know, if there was a scene of a guy sitting here, talking to you guys and he picks up the phone and goes like this, Milt would do a series of thumbnails and have him grab the phone this way, and try grabbing it this way, or like this, and he would circle the one he liked most and would move on to the next one. Literally each scene is the result of a lot of decisions that were made. That’s why the scenes feel so rich when you watch them. He was always trying to push everything to its ultimate statement. And when you watch a scene, you’re seeing one ultimate statement going on to the next. And you could say that sometimes he could get a little flamboyant and it got a little too easy to identify his stuff, but at his best, I think he disappeared as well into his characters as anyone else. Like Shere Khan or something like that. That is a very specific character. He’s not only specifically a tiger, versus some other kind of cat, but he’s an arrogant tiger who has never been confronted in his life. This was a guy that was absolutely used to winning and was so confident that he made no fast moves. And he would grab Shere Khan and just quietly choke him because he knew that Kaa would not be stupid enough to run from him. And you would have scenes like that that were very specific, and then he would do something weird like put him under a paw and then take a single fingernail and twiddle it inside the nostril of Kaa. And when you think about it, it’s a really weird thing, and yet, he’s basically invading an orifice, and it shows that he feels that he has such total dominance that he can just play with somebody’s face and they have nothing to say about it. So, it’s an artistic choice, even though he [Milt] was a phenomenal craftsman, he was also a very inventive guy. SC: It’s almost like he explored every possibility. BB: Yeah, well he gave me the work ethic of not being satisfied and not quitting. He was good just because he stayed with his scenes longer than anyone else. SC: What about Frank Thomas? Did you ever get to work with him? BB: I didn’t work with him as much as I showed him scenes and such. I did show him some, and I have known him since a very early age. I met him at age 11. Chris Padilla: What was that circumstance? BB: I was actually starting into animation and the composer, George Bruns, took me on a visit to the studio and introduced me to those guys. And he took me through and he said, “This is Brad, he’s getting into animation, and he’s gonna be an animator one day!” And they gave me this look, and I still remember it – it was pleasant, but it was a look of, “you’re gonna lose interest in two weeks, kid, and we’ll never see you again.” So it was very nice and kind of cordial, but I think that they assumed that a lot of people say that they’re interested in animation and they do it like stamp collecting – for three weeks - and then they get bored with it and move on. So I think those guys were pretty startled when three years later I showed up with a 15-minute film. CP: Nothing like having the best for mentors. BB: I believe that mentoring is important, and that most civilized societies have some kind of mentoring. They push that more…handing down their skills to someone else. I think that it’s kind of rare, and I think that I was incredibly blessed to be able to know these guys. I worked with Eric Larson as well. He’s one of the other Nine Old Men. And I know Frank and Ollie. And that’s why I’ve tried to pay tribute to them by putting them in the films. I feel like anyone doing feature character animation is standing on their shoulders to a certain degree, because when they were doing it, they had no book. They didn’t have anyone else’s films to look at, animated anyway. And they were kind of inventing the language. I feel that the bar remains set where they left it. 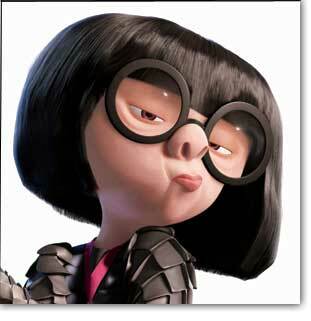 SC: Now, you call yourself a free-range animator, or “the first virus” to be led into Pixar’s controlled environment. Can you talk about how Catmull and Jobs and Lasseter brought you in to stir things up and the inevitable tension and head butting that happened, you know, some of the growing pains. BB: There was a little bit of tension in the beginning because Steve [Jobs] and John [Lasseter] and Ed [Catmull] said, “You should bring up some guys that you feel comfortable with. You can bring up the key ones.” So I picked a lot of guys that I had a great time with on The Iron Giant and brought them up. I think that the Pixar animation team, particularly, a lot of them entered Pixar straight out of school, and Pixar was their first job. I think that they felt they were in this little weird offshoot place that no one would pay attention to, and that they were lucky to have worked on films that had worked out, but I think they had some insecurity about not being experienced in 2D animation. A lot of them came right out of school and didn’t have a lot of mentoring. They were figuring out this CG thing as they went along. So they felt insecure, which I felt was kind of laughable, because did they truly not know how good they are? And I think that they didn’t. “Well Brad’s gonna bring his guys up here and they’re gonna shove us aside…” It was one of those things where the monster is scary when you don’t see it. It’s scary when it’s in the dark or under the water. The alien is scariest before you see what the alien looks like. I was an unknown, and they’d heard that I had a forceful personality or something and I was just gonna shove them aside. I laid low for a while, but once I started talking with them about working on stuff, they realized very quickly that I had a great deal of respect for their team, which is phenomenal and some of the best acting being done in animation, any animation, 2D, 3D, whatever, came from up there. So we got along together like two peas in a pod. 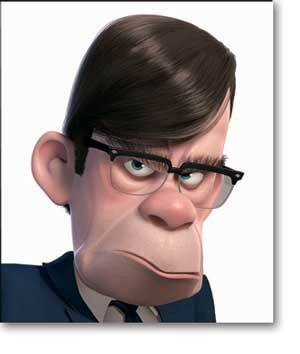 SC: So John [Lasseter] and Ed [Catmull] gave you a lot of freedom? BB: Total freedom. They didn’t abdicate responsibility – they were watching what I did – but they were very good at encouraging me to try things in a new way. We really had a tall order with the film. If you were to list the ten most difficult things to do in CG, we did all of them and did a lot of all of them! So there were a lot of people that were concerned that this was an unmakeable movie. But then there were people where this was exactly the throw-down challenge that they were looking for. 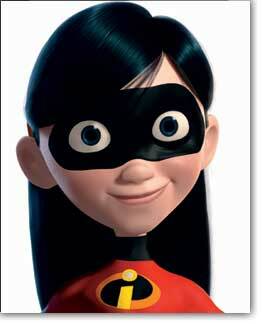 SC: I think they’re waiting to break away from the Pixar formula that Lasseter set. BB: I would maybe not call it a formula. I would say that John has a very specific style of directing movies, and I feel to a certain extent, his protégés learned that kind of style and are part of that style. Pete and Andrew were part of John’s films too. Andrew is writer and Pete is co-story writer and one of the lead animators. So I’m coming from the outside, but I feel that this film feels like a Pixar film. BB: It also has some Iron Giant-y flavor, but hopefully feels different. I think the enlightening thing is that a company that successful would be looking to throw itself off balance and grow and try different things. That tells me these guys are in it for the long run. SC: Kudos to Jobs and Catmull and Lasseter for seeing that. SC: Exactly. So, you’re known as someone who knows exactly what he wants in filmmaking. So how much did this story stray in terms of serendipity or happy accidents and became something better? BB: Oh, we had our share. I think the biggest change was the villain. Syndrome was not in my original pitch. It was a different villain. And much of the story architecture was the same, but I had a different villain. We explored the idea of having a different type of opening where you introduced Bob and Helen as when they had just gone underground as normal people. Violet is a baby, and they’re first trying to ingratiate themselves in the neighborhood. 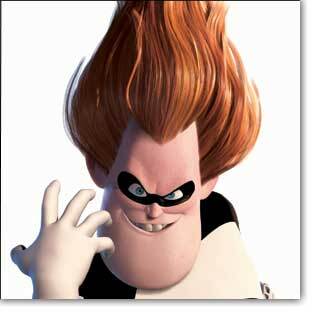 Syndrome shows up at their house – but he died in the opening sequence. Everyone liked him more than the villain I had, so I created a backstory for him and went from there. That was the biggest change. There were little changes, but they were the kind of changes that you make when you flesh an idea out. You find briefer ways to say things. Sometimes you move scenes in relation to each other. Sometimes you add scenes because you need something to show this aspect of a character. So that kind of stuff is in there, but there were no huge changes. The movie that I made was pretty much the movie that I pitched. SC: Now, how do you find the elusive “heart and soul” of a movie? Pixar seems to be able to do it more than anybody else. Is there a way you can explain it for filmmakers out there? Is it like Milt Kahl said – just keep trying and trying and trying until it feels right? BB: Well, I think you’re trying to do a few basic things. And I don’t think that it’s specific to animation. I’ve had some students ask me, “What advice would you give to an animation writer?” And I’d say, “What is an animation writer? You mean a writer?” Because I don’t think there’s any difference in writing for animation versus writing for live action. I think writing is writing, character is character, and there’s good writing and bad writing. That said, the one allowance I would give for that is that I try to write scenes that I would want to animate. That does not mean that there’s scenes that most people would think of for animation. I think that we have a number of scenes in this film that most people would think is not the kind of scene that animation normally does. I think that Bob and Helen arguing late at night is a scene that I would love to animate, but it’s not overtly an animation scene. The scene of Bob and Frozone sitting in the car talking is not overtly an animation scene. And yet, if you watch them, there are two very distinct individuals that share a past. There’s a familiarity between them. They move differently, and they have their different places in their thinking. 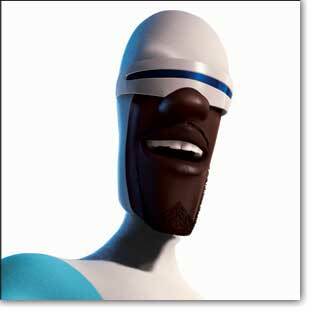 Bob’s still like happy as a clam to do this and Frozone’s starting to question it. It’s a really nice piece of animation. SC: It’s almost like Pulp Fiction, with Samuel L. Jackson and John Travolta sitting in the car. BB: Those are two very distinctive characters who are friends, but they’re very distinct from each other. And one of my problems with full animation is, often times, people do beautiful movement, but it’s not specific movement. Old people move the same as young people, women move the same as men, and fat people move the same as thin people… and people don’t move the same. Everybody moves differently. If you guys were to just freeze the way you are right now, you’re both here, sharing this moment, but in very unique ways. [Brad looks at Chris] Like, you’ve got no shoes on but you’re nicely dressed at the same time. You’re kind of off to one side, but your head is counterbalancing it, tilted to the other side like that…it’s specific to you. I wish more people would pay more attention to how things move. I don’t mean just studying how things move…that’s important to know how weight shifts and all that. But it’s also the attitude of people. I feel that a goal that we set out in this was to have every single character have their own way of moving and have it be very specific. And even though it may change from animator to animator, we came to a very specific agreement on who this character was and what kind of moves they would do. I think Syndrome has very eccentric movements. (Bird gestures like Syndrome) No other character in the movie moves like him. No other character in the movie moves like Bob. At least, we attempted to make every single character very distinctive, so if they were all in the same body and silhouettes, you would still be able to tell which one was which one solely by movement alone. SC: Absolutely. 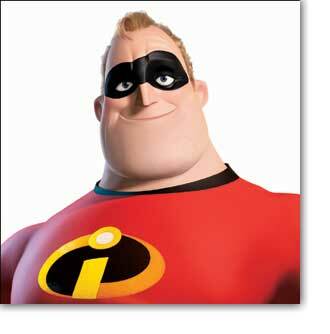 Now, when you pitched The Iron Giant, you said that it was “a gun with a soul.” Now, when you were pitching The Incredibles, what was that tagline, the heart and soul? BB: It was kind of the log-line of what if superheroes had to go through a witness relocation program and kind of hide their abilities. You have a husband and wife who had used their abilities and to sublimate them, and then you have kids who were never encouraged to use them. So, what would it be like for those kids to finally unleash them? And then you have the story of a guy who’s living in the past, and a mom that’s so living in the present that she’s cut off a certain part of herself that is still alive. It should come through that Helen gets a little bit reawakened as well. But she thinks that she’s not missing anything, but it turns out that she is a little bit. 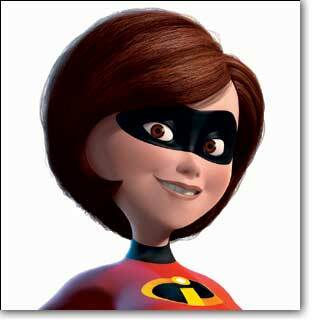 CP: The thread I like from Family Dog to the Simpsons to The Iron Giant to The Incredibles, is that you show family in a realistic setting. So, I think you’re actually spearheading a different movement by bringing realism to the animated cinema experience. BB: I think there’s this temptation to present a normal family, but I don’t know anyone who comes from a normal family. I don’t know what that is. I’m not saying that every family is hiding twisted secrets. I’m just saying that every family is really customized. BB: There are experiences that people will recognize, but everyone’s got their own things. I think that there is a tendency to de-flavorize families. My experience was that there was always a distinct flavor. The movie was trying to explore family archetypes through superpowers. The dad is always expected in the family to be strong, so I made him strong. The moms are always pulled in a million different directions, so I had her stretch like taffy. Teenagers, particularly teenage girls, are insecure and defensive, so I made her turn invisible and turn on shields. And ten-year-old boys are hyperactive energy balls. Babies are unrealized potential. So I was trying to play with archetypes. SC: How much does your family’s own quirks and personalities make it into each of the characters? BB: Well, they get in there, but they get in there without me really being aware of it. I don’t think, “Well, now I’ve got to write something that my oldest son did.” Or, “Now I gotta write something my sister did.” It’s more like I’ve been close to or in the position of almost every character in that movie. I’ve been the annoying little brother and I’ve been the fawned-over little baby in the family. I had a ringside seat for female adolescence and all the drama that comes out of that. I’ve been the clueless dad and I’m married to a very patient, strong woman. I feel like it just seeps in there when you’re writing the scenes. SC: Last question, Brad. Lasseter’s famous quote is that, “Not a day goes by at Pixar where we don’t utilize something we’ve learned from Miyazaki.” Now, in making this film, did your crew feel that way, and did you feel the same way about Miyazaki or did you have someone else that you would think about the way Lasseter did? BB: I don’t think about any one of those guys. I think you just think about the feeling you get from watching any one or all of them. I have a lot of directors and filmmakers that I admire. Some of them work in animation and a lot of them are live action guys. I think that the filmmakers that set you on fire…that desire to recreate that feeling in other people is present when you give something a shot. You want to have an action scene that gets your pulse pounding. You want to have an intimate scene that feels real and believable. Whether it’s Chuck Jones or Miyazaki or John Ford or Howard Hawkes or David Lean or James Cameron…you want to be a storyteller that makes people forget that they’re watching a movie. SC: Great! Thank you, Brad, for talking to us. We appreciate it. CP: Yeah, thank you and good luck! 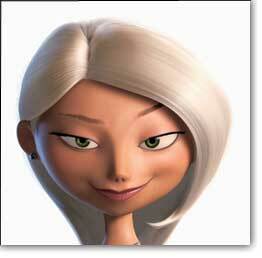 For more information on The Incredibles, click HERE. 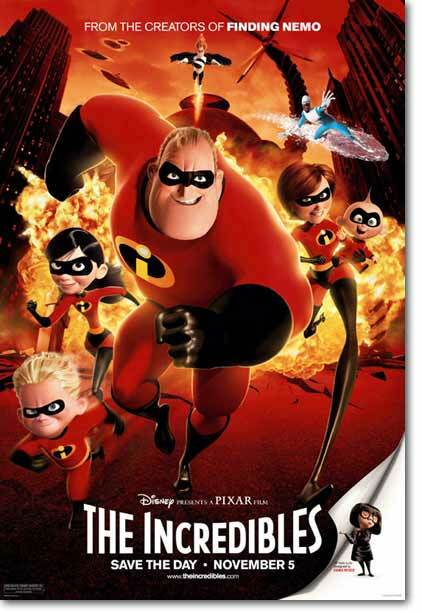 The Incredibles images © 2004 Disney Enterprises, Inc./Pixar Animation Studios. All rights reserved.